Swizz Beatz wore his art hat when he told Hip Hop Wired about his contributions to Kanye West’s Life of Pablo album. His literal art hat. But when Beatz figuratively dons his art hat, he's worn caps with other words or no words — for example, when he donned his art hat to begin his service as a trustee of the Brooklyn Museum. 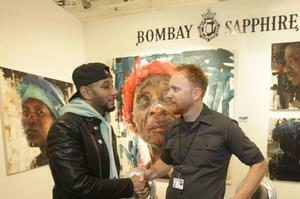 The hip hop and R & B recording artist recently donned his figurative art hat — and wore it backwards — at the March 3, 2016 reception featuring the work of Aron Belka, the grand finale winner of Bombay Sapphire Artisan Series at the SCOPE art fair. 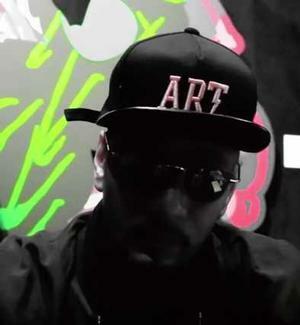 Beatz continues his fine arts advocacy in championing the Artisan Series and supporting the winning artist and his work. Belka’s “Altruist” series represents people in Sierra Leone who have been impacted by the recent Ebola crisis either through the response effort, contact with infected individuals, or both. 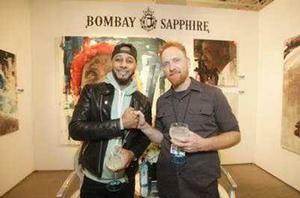 At the event, Swizz Beatz also commissioned a custom piece from Hebru Brantley, who was the 2012 Chicago finalist of the Bombay Sapphire Artisan Series. Each year, a handful of finalists are selected from thousands of online submissions and local gallery events to actually showcase their works in front of the world’s top art critics and buyers during Art Basel Miami at the SCOPE Miami Beach Art Show. In celebration of the program’s “6th Year” milestone, winning artist Aron Belka will benefit from collaboration – for the first time this year – from actress and Studio 189 founder Rosario Dawson who serves as creative mentor of the Artisan Series program. Dawson will work closely with Belka to develop a public mural installation in New York City set to be unveiled in June 2016. Swizz Beatz’ achievement as a museum trustee, art patron and collector are detailed in this Fall 2015 IRAAA+ article. In his multiple hat wearing roles, Swizz Beatz bridges the worlds of the art elite and the non-traditional art collecting public. Hats off to him for that!